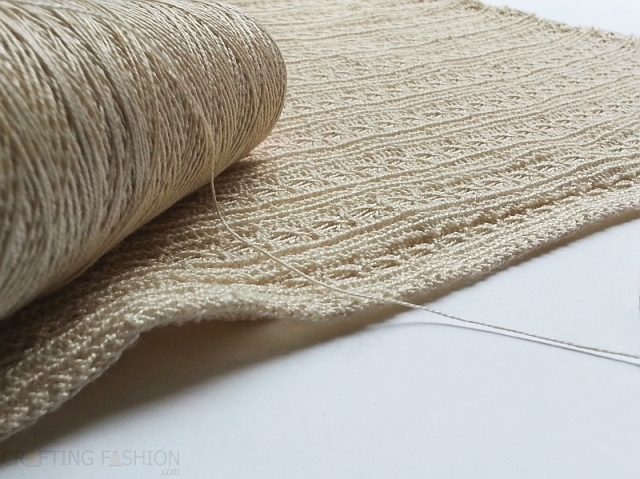 Issues come up, lessons are learned, and discoveries are made with any project like the Moonstone Sweater. Here are the ones that I haven't had the chance to mention yet. You may have noticed that the bottom edges on my sleeves and the bodice "hem" have no additional finishing. I designed the fabric for this sweater knowing that I wanted to use the fabric sideways. That is, I wanted columns of knit stitches to run parallel to the ground, instead of the usual perpendicular, using the selvages as bottom edges. With the greatest stretch running vertically, some loosely knit rib fabrics might stretch out of shape by the end of the day. My fabric is actually an "embossed rib", sort of a rib on top of a jersey backing. This should keep the sweater from "growing". So far, so good. Those of you've who read my Stabilizing Shoulder Seams post know of the difficulties I had using transparent elastic. I did admit to getting better at it. Here are helpful suggestions, both of them from Natasha over at Houseful of Nicholes, given to me during a Virtual Craft Night hangout on Google+. When I was dismayed trying to actually see the clear elastic as I attempted to machine baste it to the bodice, Natasha asked, "Any way you can mark the elastic?" Turns out all I had to do was to draw a line down the center of the elastic with my handy Frixion Pen. Things did become easier. I was excited to get a couple of pattern inquiries after I revealed the Moonstone! Yes, I developed the cotton fabric (available here), and I drafted the pattern myself. As always, it's the fabric that inspires me to create a sweater. I knew at the beginning that I wanted to work with the fabric sideways and was originally going to do one of those big openwork tunic tops. Then, this linen blend sweater by Donna Karan caught my eye. As far as I can tell from the photos, there's a seamless round yoke. Since there's no mention of it being hand knitted, the sweater may have been knitted seamlessly on a big industrial, whole garment machine similar to this one. For those of us who enjoy our sewing, I guess we'll gladly settle for seams!